Famously known as Devbhumi, or the Land of the Gods, Uttarakhand is a land of untouched natural beauty and sublime spirituality. Carved out from Uttar Pradesh, the state, formerly known as Uttaranchal, is a place that not only boasts of a scintillating view of the Himalayas but also exhibits a cultural ethos which speaks of a simplistic and harmonic coexistence with nature. With oaks, birches, silver firs and rhododendrons adorning the steep mountain slopes, Uttarakhand offers you a glimpse into an untainted, idyllic world, straight out of the pages of some ancient pastoral literature. Uttarakhand is a very popular pilgrimage site, seeing as it is the originating spot of the Ganga and the Yamuna, two of the most sacred rivers for Hindus. Uttarakhand is home to the Char Dhams, which are four of the most pious sites of pilgrimage revered by the Hindus – Gangotri, Yamunotri, Kedarnath, and Badrinath. Thousands of tourists visit Uttarakhand annually to pay homage to the Char Dhams. Ancient temples, forest reserves, national parks, hill stations, and mountain peaks welcome you in the calm, cooling air of Uttarakhand and the joy doubly increases as we reveal that you can visit some of the famous hill stations of India in Uttarakhand. Mussoorie, Nainital, Dhanaulti, Lansdowne, Sattal, Almora, Kausani, Bhimtal, and Ranikhet are ever embracing hill stations in the state best for all kinds of trips be it a family holiday or a honeymoon. Serene views and full of natural beauty. Not so extreme weather. Calm and soothing state. Transportation problems. Hilly regions can be dangerous for driving. Nature and peace lovers. Wildlife fanatics. Perfect for adventure enthusiasts and religious people. All the festivals of Uttarakhand are colourful and vibrant. Basant Panchami is celebrated with great vim and vigour. This festival marks the beginning of spring season. Yellow outfits are worn, and Saraswati goddess is worshipped. Makar Sankranti is also a famous festival of Uttarakhand. It is a religious festival, and people take holy dips in rivers, participate in Uttarayani fairs and also celebrate Ghughutia or Kale Kauva. The Kumbh Mela which is held in Haridwar is a Hindu pilgrimage, and millions of people look forward to this mela where Hindus take a dip in the Ganga. Nanda Devi Festival is held in September, and Goddess Nanda Devi is carried around in processions. Phool Dei is mainly a festival of young girls as they go to all houses in their locality and offer their good wishes for the prosperity of the household. Since the state is located at the foothills of Himalayas, it offers an ideal place for adventure activities. Besides, the rivers flowing throughout the craggy mountains make it a perfect destination for water sports. Snowfall in winters gives travellers an opportunity to enjoy skiing. For trekking, there is no dearth of trek routes in the state. Dodital, Kedarnath, Kauri Pass, Bedni Bugyal, Roop Kund are some of the popular trek sports. Most popular places for paragliding are Mukteswar and Ranikhet. Rishikesh will give you the most amazing river rafting as well as Bungee Jumping experience. You can also choose to lose yourself in the dense woods as the state has some finest natural camping sites like Bhimtal, Chokuri, Corbett National Park. Other adventures include zip-line activities, canoeing and kayaking. There are not many airports in the state. One major airport, Jolly Grant Airport is in Dehradun, the capital of the state. It is located at 22 km south-east of Dehradun and is well-connected to the main cities of India. Another airport is located in the Kumaon region of Pant Nagar. It allows domestic flight landings while the third airport, Chakrata Air Force Base is mainly used by the air force. Traditional dresses of local people in Uttarakhand are very interesting. Women wear a long skirt or Ghagri with a choli or Odhni. Both Kumaoni and Garhwali women wear this dress. The bridal dress of the locals is Ghaghra Lehenga, Choli and Pichora Ghaghra. Pichora or Rangwali is designed with silver and gold tatting. Married women put on a black necklace i.e. Chareu. Dhoti- Kurta is worn by men. Men also wear a turban which is a part of their traditional costume. There is another alternative dress i.e. Kurta-Pajamas for men which is widespread in all parts of India. Uttarakhand is also referred to as Dev Bhoomi or the Land of Gods because many Hindu pilgrimage spots are located here. The state has been ruled by the Kushanas, Kudinas, Kanishka, Samudra, Guptas, Pauravas, Katuris, Palas, Chandras, Pawaras and the British. After Independence, the Tehri princely state was merged into Uttar Pradesh state, while Uttarakhand composed the Garhwal and Kumaon Divisions. Until 1998, Uttarakhand was the name most commonly used to refer to the region. People belonging to both the regions- Garhwal and Kumaon began agitating for a separate state. Rampur Tiraha firing case on the night of October 1, 1994, led to public uproar and eventually to the division of the state of Uttar Pradesh in 2000. The term Uttaranchal came into use when the Bharatiya Janata Party (BJP) initiated a new round of state reorganisation in 1998 and introduced its preferred name. However, many controversies took place after this. Nevertheless, the name Uttarakhand remained popular in the region. Uttarakhand, located in the northern part of India, shares its borders with Nepal, Tibet, Uttar Pradesh and Himachal Pradesh. The Nanda Devi Mountains divide the state into two parts- Kumaon and Garhwal. Both these regions have scintillating views and sceneries. Dehradun, the capital of the state, is the largest city. Other prominent peaks of Himalayan ranges like Kedarnath, Trishul, Bandarpunch are in Uttarakhand. The Ganga, Yamuna, Ramganga and Sharda rivers form a part of the geography of the state. 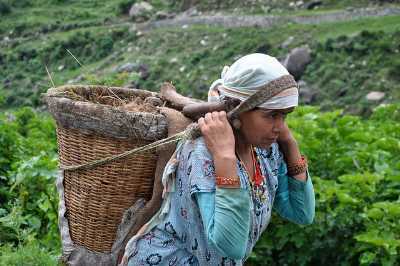 the people of Uttarakhand are simple folk and are known to be warm and welcoming. Among the prominent ethnic groups of the state are the Bhotias, the Jaunsaries, the Tharus, the Bokshas and the Rajis. Pahari is spoken by the locals while Hindi is also spoken and understood in the state. Religion is a vital part of daily life for the people of these hills. Large segment of the people in Uttarakhand are heterodox Buddhists and Hindus. Dances like the Langvir Nritya, Dhurang, Pandav Nritya, Chholiya, Hurka Baul and Jharva are popular, particularly during fairs and festivals. wood carving is the prominent, Kumaoni art often is geometrical in nature, while Garhwali art has long been known for its closeness to the Mughal style of painting. Other crafts of Uttarakhand include handcrafted jewellery- usually of gold; basketry from Garhwal; woolen shawls and scarves and rugs. The food in Uttarakhand is simple, prepared with local ingredients, using herbs and spices which make the food highly energetic. The cooking methods here, are generally elaborate and time-consuming and make use of a generous dash of distinct spices.